In January of 2018, I traveled to Andøya Space Center in Andenes, Norway, to attend a four day rocket field school. My name is Hannah Gulick, and I am a sophomore at the University of Iowa studying astronomy, physics, and creative writing. I went as one of two University of Iowa students to be part of a rocket campaign in which we designed, built, flew, and analyzed data from a sounding rocket. We were the first American students to join 17 other Canadian and Norwegian students at the space center for the CaNoRock program. Andenes, being about 300 kilometers (190 miles) north of the Arctic Circle, is a stunning landscape of mountains, fjords, and the ocean, and promises days without sun in the winter and nights without darkness in the summer. It is also frequented by the aurora. Aurora, while incredible to watch, also offer a lot of scientific achievement. 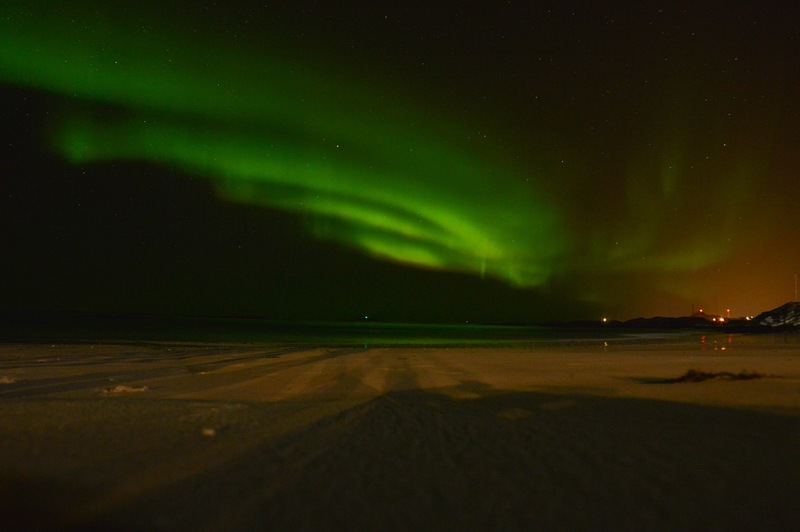 The scientists at Andøya Space Center (ACS) take full advantage of this research possibility, by launching sounding rockets into the aurora to learn things about magnetic fields and their corresponding properties, like movement. This research helps space physicists to being an understanding of space weather, and find ways to protect Earth from its hostile moments. 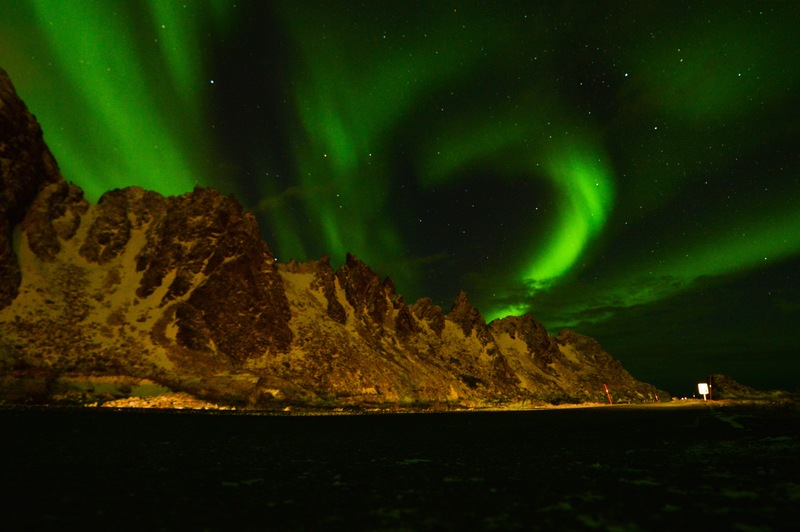 The reason for all of this research also means that Andøya Space Center is a promising place to see the aurora, with a near fifty-fifty chance it will appear each night. Knowing this, my University of Iowa team and I endured the two-and-a-half-day, five-plane journey it took to get to Andenes, and hoped for a night that was cloudless and full of the northern lights. This night came not once, but twice, during our four day stay at ACS. 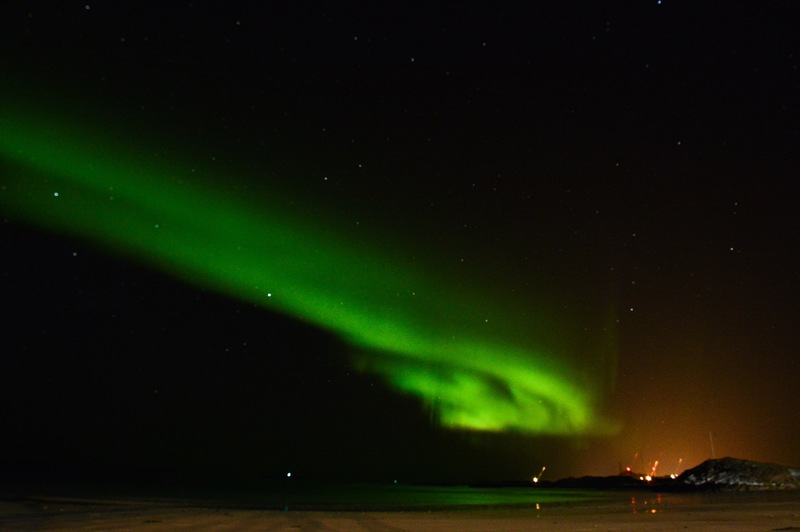 The first time was our second night in Andenes, and it was a surreal experience. The aurora started early in the evening, around seven pm (they normally start around ten-eleven pm), with a dim green line peeking from behind a wall of mountains. Most of the students at CaNoRock, myself included, had never seen the aurora before, so we put on reflective jackets and walked down the road, away from the light pollution given by the space center. It did not take long before the aurora took over the sky in shining green waves that poured from between mountain peaks and out across the ocean. It was a scene many of the scientists at ASC had seen before, and even tested with a sounding rocket, but a scene that, nonetheless, demanded everyone’s attention and left them with a feeling of awe and an inability to fully appreciate the night sky. The next day, the CaNoRock students felt the same motivation and curiosity instilled in the professionals working at ACS by the watching the aurora, as productivity was at an all time high. There were five CaNoRock teams; payload, rocket telemetry, rocket physics, TM readout, and rocket systems. Each team worked to complete an important piece of the rocket campaign, from building instruments, and designing software that could read data sent back from the rocket, to controlling radio antennas during the rocket’s launch, and calculating where the rocket would land. I worked as part of the rocket physics team to calculate the flight mechanics of the sounding rocket during launch. Our rocket was a Mongoose 98 with a carbon fiber body tube and aluminum nose cone, measuring in at eight feet eight inches tall. I worked with my team to apply a simulation with the actual size and shape of the Mongoose to find the temperature, pressure, and air density around the rocket’s body as it would be when beginning its ascent into the sky. We found that even the slightest inconsistency in its exterior, a parasitic point or divot a millimeter deep, would drastically affect the way the rocket would take off and continue through flight. This is very important, as the Mongoose is launched toward the ocean, but as our simulation showed, even a millimeter can make a difference, and a difference can be dangerous with a space center, fishing boats, and a town nearby. We then applied this when testing the rocket’s spin and flight trajectory as altered by a change in a parameter like fin shape. When launch time finally came around, inspired by the northern lights, we prepared our launch as if we were testing the aurora (which we weren’t, it was daytime and we would have needed a much bigger rocket). I was elected principal investigator of the campaign, and I was able to lead the science report relayed over the intercom to all of the different rocket systems. The report consisted of interpreting space weather conditions and magnetic field directions for a real aurora sounding rocket. This meant that we were learning how to check whether the solar wind lines were pointing to the north or south, and finding the magnitude of the vertical magnetic field lines as we were preparing for the launch. As the countdown finished, and our rocket began to take flight, we all watched, proud of our week’s work. The celebration was brief, however, as we immediately began analyzing our successful data, predicting altitude, finding drag coefficients, and calculating speed and acceleration. Our rocket, we concluded, reached an altitude of approximately 8.4 kilometers, the highest one yet. At CaNoRock, I found a new understanding of mathematical applications, simulation use, and an awareness that there is more to rocket science than just building a rocket. Interpreting raw data, that is not presented like a question in a physics textbook or with a known solution, is difficult and uncertain. We had to decide how to read our data, whether instances in our results were real anomalies or radio dropouts, and if our instrumentation was even working correctly. However, with time and collaboration, we finished our week with answers; about our rocket launch and our careers. 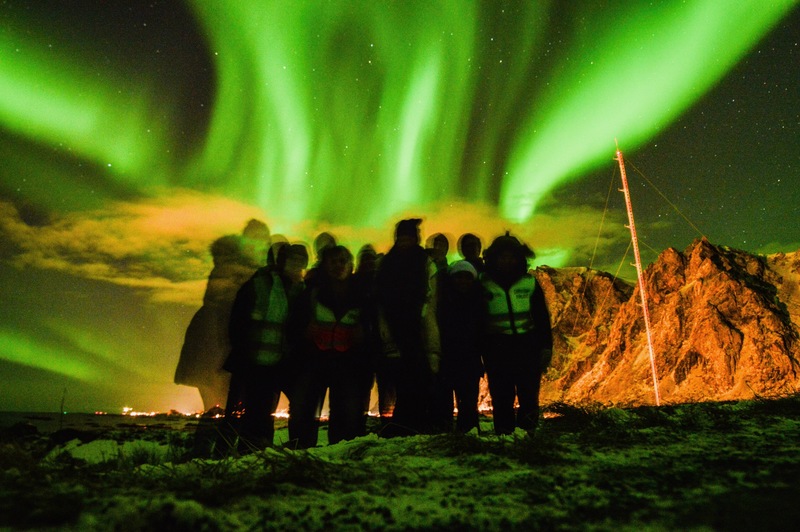 We left Andøya having begun our journey from students to early career astrophysicists and engineers, waiting for our chance to watch a rocket fly into the night time aurora. Thanks to Hannah, Profs. Alison Jaynes and David Miles at U. Iowa for this guest post! This entry was posted in Chasing the Aurora: First-hand accounts from our users, Education. Bookmark the permalink. ← Aurora chasing in Alberta – what’s it like to see STEVE in real life?